Our 2019 International Conference Registration Rates are shown below. All rates are shown in USD. 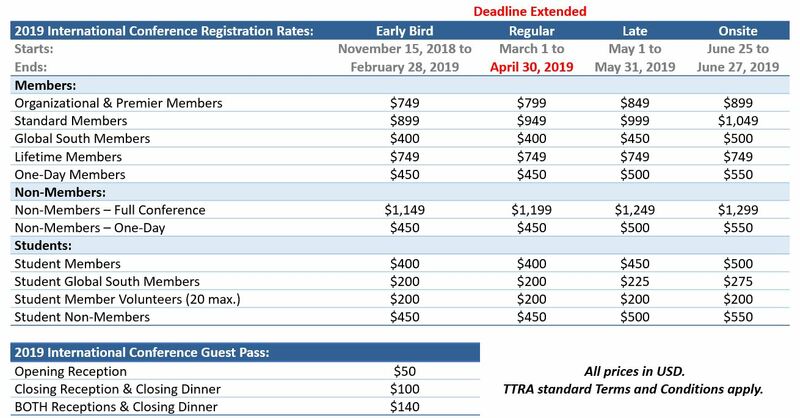 PLEASE NOTE: If you are a current TTRA member, you must log in when you register for the conference in order for the system to recognize your membership and charge you the appropriate member rate. If you have any trouble registering, please contact info@ttra.com. Complimentary PARTNER registrations will need a promo code to use when registering. Please contact info@ttra.com for this code. The STUDENT and LIFETIME Registration rates are already discounted; therefore, no additional promotions or discounts apply. No additional promotions or discounts apply to one-day registrations or guest passes. GROUP POLICY: For companies/organizations who register three (3) or more professional PAID attendees, there is a 15% discount off the full conference registration rate of all attendees (unless the attendee is not allowed to receive further discounts, e.g Lifetime Member attendees). To take advantage of this promotion, please register and pay for all attendees at the same time. Attendees will need to be registered individually and for each registration, you will need to use promo code 2019ConfGroup. Be sure to click APPLY after entering the promo code before you check out. Please note that is one (or more) of the group members cancels their registration and/or payment, the remaining group members will be billed the 15% difference. CANCELLATION and REFUND POLICY: Registration cancellations received prior to May 10, 2019, may be eligible to receive a refund less a $75 service fee. There are no refunds for cancellations made May 10, 2019, or after. Refunds will not be available for registrants who do not attend and are considered a “no-show”. Cancellations will be accepted via phone (248-708-8872), fax (248-814-7150) or e-mail info@ttra.com, and must be received by the stated cancellation deadline. All refund requests must be made by the attendee, paying organization, or credit card holder. If a credit card was used for payment, refunds will be credited back to the original credit card used. If payment was made by cash or check, refunds will be made by check to the member or paying organization. If a refund is necessary by wire transfer, all applicable fees will be charged to the canceling party. These above policies apply to all TTRA events unless otherwise noted in the corresponding event materials.